Maadhurya in the Sanskrit language means “Sweetness”. Each song in this album of 12 Spiritual Songs or Bhajans is enriched with a sweetness that many a listener is captivated by. Sung by Sai Ganesh Nagpal and Saraswati Nagpal, accompanied by an ensemble of instrumentalists. This is definitely a “must have” collection of songs, each song immerses the listener in the ambrosia of the Atma or the Higher Self! This digital music album is fully downloadable upon purchase. This album is aptly named. 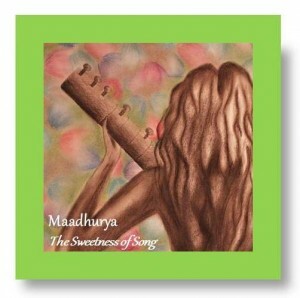 Each “bhajan” or devotional song feels like liquid honey, spreading its warmth and taking all the discord away. I have been enjoying these bhajans in Sai Ganesh and Saraswati Nagpal’s voices for some time and would unhesitatingly recommend them. The deep devotion in their voices and the sweetness of the melodies, combined with the simplicity of the words makes this an easy addiction for me. This one is definitely a 5-starrer for me.